How Can the American Game be Called Football ? Football in North America is a far different game than what the rest of the world calls football. The North American versions are rough, violent games. The rules are somewhat different between the Canadian and the American versions but the American teams have more money so the best players play in the US league called the NFL. The Americans think that their brand of football is the epicenter of courage and physical fortitude. In like manner, they believe that Las Vegas is the epicenter of great holidays. Neither is true; in this article we’ll demonstrate to Americans that their brand of football is simply barbaric whilst ours is beautiful and requires no less physical fortitude than theirs does. North Americans have never given real football a chance to prove itself. Now, with Tottenham facing two decisive Champions League matches this week, first against London rivals Arsenal this Saturday and then next Tuesday against Dortmund, we feel the time has come for North Americans to come home to real football, as it were. We urge everyone to forward this article to a friend or family member in North America and put them on the path to redemption. 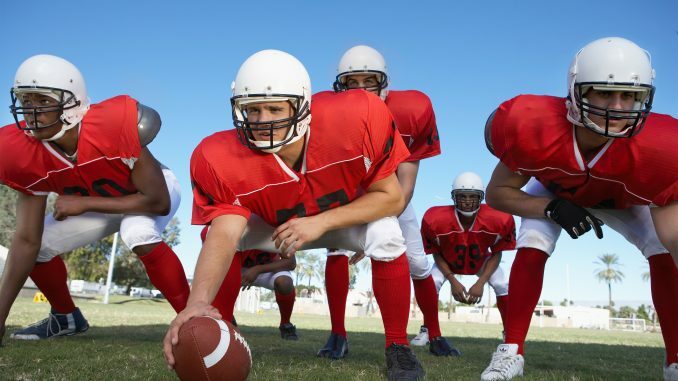 In American football, many of the players weigh in at more than 20 stone. These are called blockers. They have little in the way of athletic skill save from their enormous bulk. They protect the smaller players. Thus every North American football club has only a small number of skilled players and a large contingent of hulks. Clearly, should one of the skilled players suffer injury, it might doom the entire season for that unfortunate club. In general, the team with the biggest hulks has a decisive advantage over teams with smaller hulks. In real football, every player is a skilled player. There is no room on the pitch for a hulk weighing in at 20 or more stone! Injuries hurt but are rarely devastating; they require adjustment not the abject despair that Americans football fans feel when their quarterback “goes down”. American football has finally begun to come to grips with the enormous number of head injuries suffered by players who wear protective helmets but use them as battering rams and thus remove the helmets’ protective intent. If you watch an American football game for only five minutes, something that might take twenty or more minutes to accomplish given the large amount of dead time between active playing, you’ll see many instances of players hitting an opponent’s helmet with their own. We cringe at the thought that many American brains may have been scrambled in youth whilst playing football. It would account for quite a bit. Many parents and youth are not playing American football in youth or school leagues. This will inevitably lead to the demise of American football as they know it. Now is the time to show the benighted Americans that real football is truly the beautiful game. We mentioned dead time above but it deserves further elaboration. American football stops after every “play”. Television imposes artificial stoppages of play at often the least opportune time. It is very difficult for an American football team to establish the psychological sense of momentum. Here, a team has several good plays in a row and the television bureaucrat signals that it’s time to stop play so they can sell something. It’s also a known fact that the things they sell during these so called football “games” is not worth buying in any case. We count soft drinks that are so sweet they might as well be plain sugar; beer that isn’t real beer at all; and hamburgers that would embarrass a cow if a cow knew that it was being sacrificed for such “food”. Even when television isn’t stopping the action, the action stops on its own. Then the teams hold a committee meeting and another “play” occurs. Some “plays” are designed to fool the other team much later in the game. Americans think that they are the greatest fans in the world. Every team in every team sport in North America tells its fans that they are the best fans in the world. Americans don’t know the first thing about being fans of a club. Our fans have songs and chants. 100,000 fans rise up together to sing and chant and keep it up for the duration of the match. In the US, fans might scream once in a while but mostly they curse. They curse their own team for making a mistake; they curse the opposing team for not making a mistake; they curse the referees for making endless mistakes; they curse everyone and everything. These days, many fans blame their team’s woes on Donald Trump because everything is Donald Trump’s fault. American football is a street brawl held in a stadium. It has more in common with Roman gladiator contests than with 21st century athletics. Tell your American friends and family to watch British football and especially Tottenham this week and they will realize that our version of football is real whilst their version of football is a prison riot held in front of thousands of so-called fans!